This is one of those days I want to remember. I am dead tired but I have to write it all down while it is is still fresh in my mind. Almost two years ago, El Centro was in a good place in many respects. We had offered the first wonderful summer reading camp program, our worship was lively and we had just begun a partnership with the Department of Families and Children so we were starting to process foods stamp and Medicaid applications for people in the Latino community. We also didn’t have much room to grow and would soon be looking at a move to another storefront. At about the same time, life had gotten awfully scary at St. Ambrose just 10 blocks away from us. The organization that had been renting a large part of the property was moving away and taking 2/3 of the parish income with them. On a lot of faith, with nothing but a handshake between us, the Diocese of Southeast Florida, St. Ambrose, and All Saints/El Centro agreed to become what we now call the New River Regional Ministry–something more than a parish, a bunch of people whose focus would be on ministry, an experiment in grace capable of transcending every sociocultural difference imaginable in order to serve God and our neighbor. Today began with the service at 8. In most Episcopal Churches this is the service attended by “God’s Frozen Chosen” according to many. In fact, I have found a warm, loving community and because of the special needs of our newest member to that service, we arranged to have our bishop’s visitation and annual confirmation service at this service. The service was beautiful. There were so many people, so many people being welcomed into the Anglican Communion. The energy! We wouldn’t be Episcopalians without good food so we all feasted on the wonderful breakfast Angel and Diana had worked on till almost midnight last night. We had the regular 10 o’clock service where we celebrated the 93rd Birthday of one of our dearest members. We remembered the loved ones we’ve lost. I forgot to take communion down to Edith, our birthday person who is too frail to come to the rail, and when I realized what I’d done I almost burst in to tears but recovered enough to take the bread to her while Angel carried the wine. Then at noon, members of El Centro and St. Ambrose who are working together on a redevelopment project sponsored by the national church came together for a working lunch. We discussed the liturgy we are going to test during Advent. For months, several of us have felt the gentle nudging of the Spirit, reminding us that “a house divided cannot stand”. 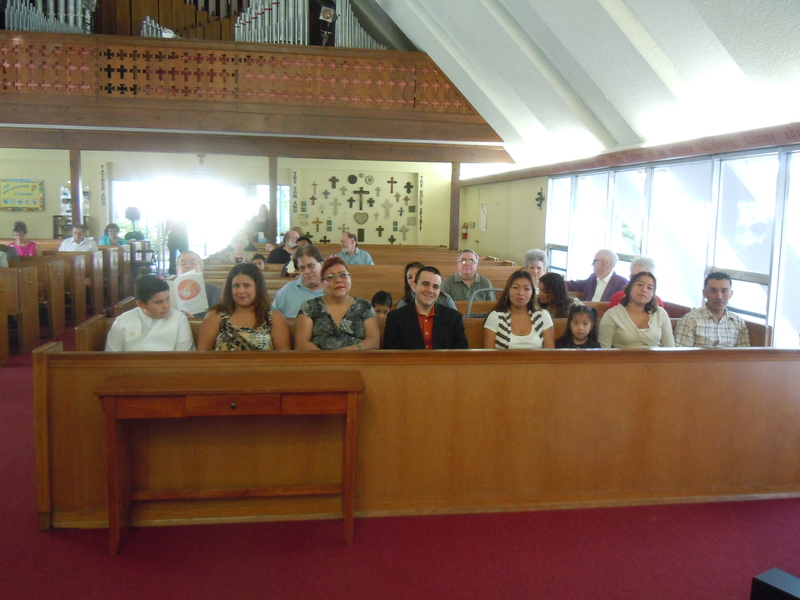 Members of El Centro and St. Ambrose used the same worship space but very rarely even saw each other. We have identified the essential elements of unity in the Sunday service of the Episcopal Church. We also think we’ve found a way to honor the need for each part of the community to pray in their own language. We’ll start with the Liturgy of the Word in English. Right before Confession, the Centro community will come into the service, along with all our kids who will have been at Sunday School. We’ll do communion and our English speaking members will recess out while El Centro folks will stay on for the Liturgy of the Word in Spanish. At our meeting today, we put two more pieces in place. During the Liturgy of the Word in English, we are going to have a special bilingual advent program for the children of both services. During the Liturgy of the Word in Spanish, the children will now have Coach Hudson and Coach Harman who will supervise soccer, jump rope and other games that kids can play with a large rubber ball. It is hard to explain to someone who is not part of this journey how scared we all were when we started down this road, how hard it has been at several points, and now what a deep joy is beginning to spread in our midst. Being willing to surrender the comfort of our familiar rites and rituals on Sunday morning to something far more risky, just because we want to learn some more about what it means to abide with each other is a brave, profoundly gracious act of faith. I am in awe of the way God makes all things new. On this day when the church celebrates the communion of all saints, we aren’t just remembering the ones that have gone before us. We’re trying to follow in their footsteps. This week more than usual, I found myself almost begging for the right heart, the right words, the spirit with which to speak to you from this pulpit, a place of such honor and such enormous responsibility. I have this almost irrational belief in the transformative power of words. Today I want my words to have that kind of power and the paradox, of course, is that even as I try, I have to be willing for my words to be absolutely powerless so that it will be the Spirit that will fill your heart with the true Word of God. In a little while we will have our parish meeting. You will hear good news. As I gathered information, looked at a lot of numbers and tried to put them in the context of the last few years, a few things struck me. We are doing so much more with so much less that it is nothing short of a miracle. Out of despair and disappointment, God has made us new. We may not feel we’re new, but there is something new at St. Ambrose that is worthy of celebration. Finally, on that gray and dreary day in December of 2009, your leadership showed such courage when they decided to accept help from others, even though you didn’t really have much reason to trust the hand that was being extended to you. That willingness, which some might see as weakness, is what made this community so strong. Here is another paradox. All the good news is just enough to prepare for this: As much as we’ve accomplished, all we’ve done is take a tiny baby step forward. We are being called to take the next step. El Centro and Saint Ambrose need each other in ways that we have not yet acknowledged to each other or even necessarily to ourselves. We need each other because we have complimentary gifts and weakness and God needs us all working as one to pull this ministry through. We need each other because we can call out the best in each other and surprise ourselves, and others, by what we can do. Today’s readings underscore the magnitude of our call. We have to do mercy and practice justice. Each of us is tempted all the time to engage in empty piety and easy faith, so that the things we say we believe and the things we actually do must make God shudder. We can be for each other a community of hope and accountability. Finally, we need each other because each of these communities by itself is simply not viable, it is not viable financially, it is not viable practically, it is especially not viable spiritually. One of the times when we most need each other is Sunday morning. Eucharistic Prayer C is so eloquent in this: we gather to receive the solace and strength, the pardon and renewal that can truly make us one body and one spirit in Christ to then go back out to serve the world in God’s name. We need each other because St. Ambrose needs the energy and life that young families and children can bring and the folks of El Centro need the wisdom and grace that come with having been through a lot and lived to tell the story. We may not see it clearly but we know that trying to continue to go it alone will not carry us very far. A small group of folks including Carl, Wayne and Jeanne, a member of the Altar Guild, and Carmen, Tania, are going to work with me to develop a liturgy for Advent that will bring the two communities together for part the Sunday Eucharist. We will move forward slowly, carefully, reverently. We will listen carefully and we will do everything we can to be both respectful and hopeful. I have to tell you honestly, that I lead you into this with fear and trembling– I understand those words of St. Paul’s with a new intensity. But I am also quietly confident that God will show us the way. After I prayed and prayed and then prayed some more this week, I began to feel like Donkey harassing Shrek. As so often happens, what I heard was a gentle silence in response. But while I was out on a walk, I remembered a piece of music that I first heard about three years ago and that I love. The pieced is called “Kyrie Litany of Praise.” It captures yet another of the central paradoxes of our faith. The words are very simple: We praise you oh Lord you give us living waters, Lord have mercy. We praise you oh Lord, you open our eyes, Christ have mercy. We praise you O Lord, you give us life eternal, Lord have mercy. If there was ever a time when we needed to praise God for all our blessings and at the same time, to beg for mercy this is it. As you listen to it, imagine—this could be us.